Mount Schank is an inactive maar volcano in the south-east of South Australia, near Mount Gambier. It was named by James Grant in 1800 after Admiral John Schank, designer of Grant's ship, the HMS Lady Nelson. Mount Schank is part of the Newer Volcanics Province, which is the youngest volcanic field in Australia. 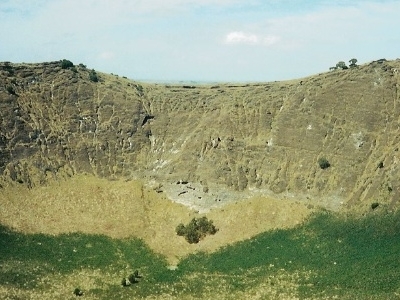 Mount Schank erupted in the Holocene, 5,000 years ago, about the same time as Mount Gambier. It is a very basic ash cone perhaps a hundred metres high, and the base of the crater does not extend below the water table, so there is no crater lake as with those at Mount Gambier. There are two small subsidiary craters adjacent to the main cone and some lava flows resulting from the eruption. The northern crater is circular, 300 m (980 ft) in diameter and 100 m (330 ft) deep, the older southern crater is 200 m (660 ft) in diameter and partially overlapped by the larger crater. The local Aboriginal Bunganditj people witnessed Mount Schank's eruptions over time. Their creation story about the local volcanic landscape was recorded by a local woman, Cristina Smith, in 1880. It tells the tale of Craitbul, a giant, who was looking for a place to live with his wife and two sons. They camped at Mount Muirhead and Mount Schank, but were scared away from both these camps by a moaning bird spirit. They fled to Mount Gambier, leaving their camp ovens (the volcanoes) burning. After some time, water came and filled their ovens, putting them out and driving the spirit away. They continued to live in a cave on the side of Mount Gambier. The site is accessible from the Mount Gambier-Port MacDonnell road about 20 km (12 mi) south of Mount Gambier; there is a small carpark and picnic table, and steps have been placed to facilitate the short but very steep walk to the rim of the crater. It is a fairly simple walk to traverse the rim, though the exposed situation can be treacherous in gusty weather. Here's the our members favorite photos of "Volcanoes in South Australia". Upload your photo of Mount Schank!